We had received an email response from Councilmember Tom Hucker of Montgomery County, Maryland regarding our campaign. 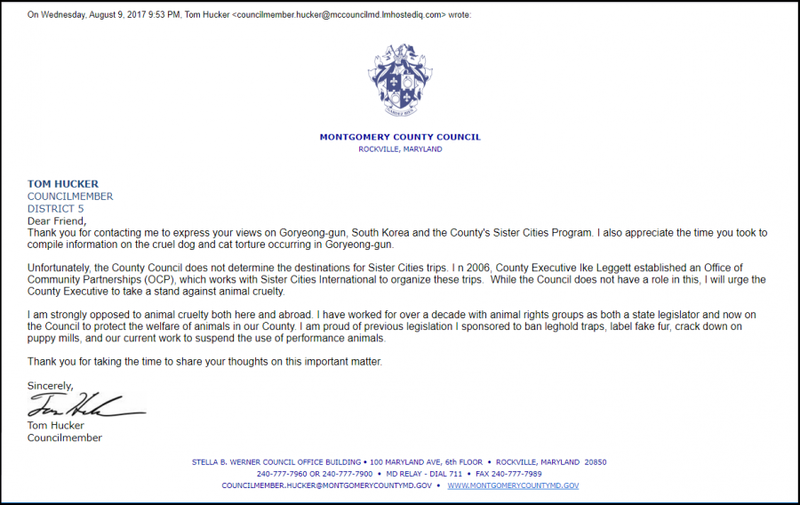 We asked Montgomery County to take action against the dog meat trade in Goryeong-gun, South Korea. We are grateful to Mr. Hucker for responding to our concern so quickly, and for expressing his support for our campaign. He informed us that he is “strongly opposed to animal cruelty both here and abroad”, and that he “will urge the County Executive to take a stand against animal cruelty”. We hope that the Councilmember Hucker will be able to bring the county leadership on board to speak out against the horrible cruelty, and urge Goryeong-gun to enforce the law to close down the illegal dog meat industry. Please send a letter thanking Councilmember Hucker for responding to our concern and for his support of our campaign. You can use our suggested message below or your own words. We thank you for responding to our concerns raised via the recent petition on Change.org about the mistreatment, torture and consumption of companion animals in Montgomery County’s Friendship City, Goryeong-gun in South Korea. Thank you for your help in urging the County Executive to take a stand against animal cruelty. Both domestic and international pressure on this issue is required if we are going to incite some real change in South Korea. So, we hope that the leadership of Montgomery County will join our voice and help bring an end to the horrific and illegal practice of the dog meat trade, permanently. Thank you again for your efforts on this matter. good reaction !!! hope that he will be able to do more !! !